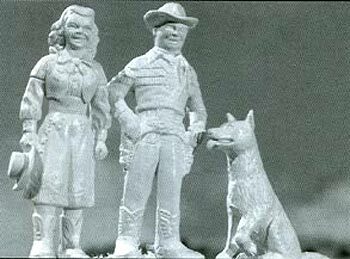 Issue 24 - OUR GALA ROY ROGERS CHRISTMAS SPECIAL! 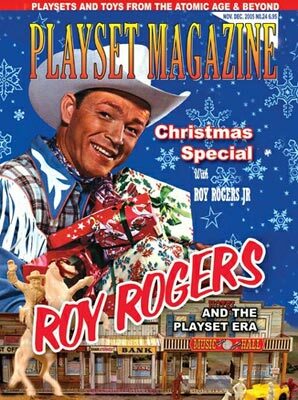 This giant new issue is just brimming with festive and feisty info on the complete line up of Roy Rogers playsets, from the earliest right up to the transition years of the mid-Fifties. In this one issue you'll get inside info from the Marx designers themselves on what excatly happened to create these famous, desireable sets. Why was there so much confusion on those early character figures, anyway? We've got the inside story! And what was he rarest of these sets? We have the story for you. And what about the exact contents? Here you'll find the most comprehensive contents listings ever, mint in the box! Roy Rogers, Jr. helps us understand what it was like to actually grow up with the legend his father was, and explains the importance of toys to Roy Rogers himself. MORE? You bet -- this issue is so full we added EXTRA PAGES to accomodate MORE color pages, and the Christmas Special is simply bulging with literally 100's of playsets for sale, plus reviews, news and more! Barzso's Fort Ticonderoga style Stone Fort. Your eyes will pop when you see this spectacular 4' by 4' fort with thousands of individually hand carved stones and breast-works! Barzso's Lewis & Clark playset - with a fabulous, floating keelboat outfitted and a real, 80 year old canvas top! Conte's Alamo Mexicans! Get a first look right here to see what tyhey've come up with after two years of waiting!